Okay, so it's hard to rate this book. 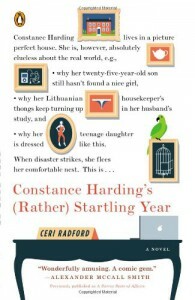 It was delightful to read in spurts, but as a book that one reads long-term, it was kind of insufferable. It has the amusement and whimsy of a really naive narrator (Constance), who clings to the conservative British upper class and The TImes. God forbid her son should read The Guardian! And, why, by the way, is her son completely uninterested in any of the girls with which his mother tries to set him up? Constance's narration in the first couple of chapters is amusing. Really cute, quirky, and funny in her naivete. It reminds me (fondly) of William Kuhn's Mrs. Queen Takes the Train. But you keep expecting this narrator to WAKE UP. It's really hard to stomach 200 pages of the same naive misunderstood sheltered chatter that Constance pursues. One of the most annoying and ill-executed parts of the book is how long it takes Constance (the entire book) to figure out that the reason her Latvian housekeeper keeps leaving lingerie all over her husband's office is because the two of them are having an affair. (This isn't a spoiler; it's literally on the back cover description of the book). So, we, the reader, know what Constance does not; that her son is gay; that her husband is being unfaithful, etc. It works for a while with humour and whimsy (Constance: "I simply can't figure out why Natalia leaves her underwear in my husband's office! Perhaps she was trying to do laundry and got lost.") but after 3/4 of the book has past and Constance is none the wiser about anything, it's a little annoying. Ultimately, there's a rushed (in my opinion) attempt to turn the book from farce/humour into realistic heartwarming material. But it's done too quickly at the end. One can really flip by the pages in the middle and miss none of the plot. Again, really well written, and really humorous, but if the author had cut some of the middle, moved the plot so that Constance begins a learning curve earlier, and gradually comes to realize things more quickly. It would have been more delightful, because it's really annoying to stay with a character for 200+ pages who still doesn't get what is right in front of her. That said, after some flipping around (just a little), the book concludes with a rather different Constance. Though the ending/resolution/denouement is a little too fast, and while I wouldn't call it "heartwarming" in the end after being dragged through all of those pages, it is still a wonderful concept, an extremely well-written book (even if some parts are just redundantly redundant----that was on purpose----), if the plot structure had moved a long a little more quickly, it would have been definitely spectacular. But, still, it's a very good, funny book. Written hilariously and impeccably. You might not want (or need) to devote the total energies of faithful reading to it because it got bogged down in the middle, but, ultimately, it delivers as a light, whimsical, deeply funny book. The author is to be commended for her writing, which never misses a beat in its subtle humour. Everything from Constance's point of view is simply deliciously amusing. We laugh not because she is ridiculous, but because she really doesn't understand what is going on. Her world is one of Harrods and the Conservative Party and lunches and a total lack of familiarity with public transit. She brings mace with her when she goes to London. She fears for drinking water when she visits Spain. Old-fashioned jingoism, indeed, perhaps, but she's kind of like an exaggerated version of a character on Downton Abbey (As Lady Violet said after the Mr. Pamuk incident in Season 1 "No Englishman would have the rudeness to die in someone else's house). Very British humour, and really delightful. Buuuut just don't get too frustrated with the middle. Move along!